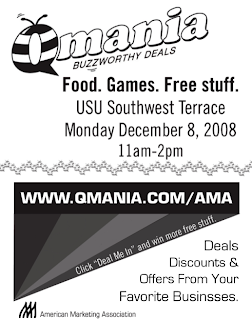 Monday, December 8, from 11 am to 2 pm, is the Qmania CSULB AMA event at the Southwest Terrace of the Student Union at CSULB. Come join us for some food, free prizes, and lots of fun as the American Marketing Association promotes Qmania on campus. didn't go. Was it cool/fun?